Barcelona collective Ojos de Brujo could never be accused of going about their business conventionally as they celebrate their tenth anniversary with a special recording. A celebration in which many artist friends collaborate on the group’s songs as well as providing two brand new ones: the title track, produced by long time spar Nitin Sawhney and “La Machine” by Juno Reactor. Also included is their lusciously fluid flamenco re-styling of Marley’s “No Woman, No Cry”. “Corriente Vital” (Lifestream) contains songs from the extensive OdB canon transformed by producers such as Italy’s Tom Waits Vinicio Capossela, Jorge Drexler – the first Uruguayan ever to win an Academy Award (for his work on The Motorcycle Diaries) and Roldan from Cuba’s Orishas as well as the aforementioned Nitin Sawhney and Juno Reactor (who participated in the OST of “Matrix”). Word has it that “Corriente Vital” could be the band’s last offering for some time as the different members experiment in other areas; and if that proves to be the case it can honestly be said that they kept their freak flag flying until the end, staying true to themselves and their principles. A large part of Ojos de Brujo’s legend is based on spectacular live shows where they have never been known to give less than 100%. Their performances are rooted in flamenco with flavourings from reggae, raga, rumba, hip hop and house melded into their trademark jip jop flamenkillo. The last chance for the foreseeable future to catch one of the world’s most vibrant and inventive bands in any genre, takes place on April 15th at the Barbican. Prepare for a musical version of El Clásico with multifarious musical fireworks. La Linea ’11 lands with its trademark mix of established heavy hitters plus the best of the new generation plucked from throughout the Latin music diaspora – with Spain, Argentina, Mexico, Cuba and Brighton all represented. 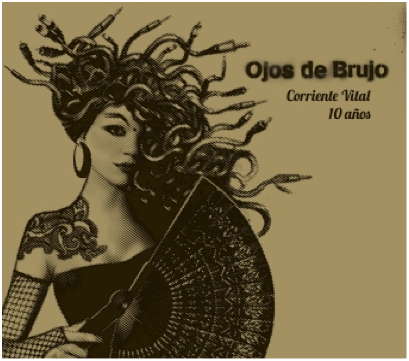 Barcelona’s Ojos de Brujo have never been known to give less than 100% in a stage show rooted in flamenco with flavourings from reggae, raga, rhumba, hip hop and house, and as this will be their last show for at least 2 years expect multlifarious musical fireworks. Debutants include Spain’s Muchachito with Santos de Veracruz, Depedro who will be supporting Ojos de Brujo and the entire Twisted Cumbia night line up of Mexican Institute of Sound, Axel Krygier, Pollito Boogaloo who are all La Linea virgins. And then there’s Orquesta Buena Vista Social Club® Featuring Omara Portuondo and paying homage to the music and musicians who helped make Buena Vista Social Club the worldwide phenomenon that we all know and continue to love. Something for everyone at London Mela: live music, dance, visual arts and food! Gerry Lyseight is a legendary selector with an ear for the dancefloor! He famously founded the Mambo Inn back in the 90's and continues to curate music festivals and produce global music bands of the higest calibre. He is back at Mango Landin tonight for his monthly session of Latin, Jazz, African, Funk, Reggae, Soul, Swing, Hip-Hop and Kitsch.